In the first chapter of his record, Nephi said he would show unto his readers that the “tender mercies of the Lord are over all those whom he hath chosen, because of their faith, to make them mighty even unto the power of deliverance” (1 Nephi 1:20). This passage, which has been described as Nephi’s “thesis statement,”1 can help us identify a key theme in Nephi’s writings, especially in the book of 1 Nephi. Nephi, however, clarified that the Lord’s tender mercies are specifically available for those “whom he hath chosen, because of their faith” (1 Nephi 1:20; emphasis added). We know this point was important to Nephi because he emphasized it over and over again in the stories he told about his family’s journey. For instance, when Lehi’s sons were commanded to get the plates of brass, Lehi declared to Nephi, “Therefore go, my son, and thou shalt be favored of the Lord, because thou hast not murmured” (1 Nephi 3:6; emphasis added). In other words, divine favor, including greater access to God’s tender mercies, is directly contingent upon righteousness. Because all of God’s children have an inborn ability to discern between right and wrong (see Moroni 7:15–16), it means that all are free to choose the right and gain access to the Lord’s tender mercies. For this reason Nephi could appropriately add that “the Lord esteemeth all flesh in one; he that is righteous is favored of God” (1 Nephi 17:35). Nephi’s thesis wasn’t intended to arrogantly prove how amazing he was or how much better he was than his brothers.11 Instead, it seems his primary goal was to persuade his readers that the tender mercies of the Lord are available to all of God’s children. Being favored of the Lord isn’t based upon race, ethnicity, language, culture, nationality, wealth, or any other arbitrary factor. Instead, the Lord tenderly and lovingly provides additional blessings for those who faithfully and righteously come unto Him. For this reason, Nephi declared, “For the fulness of mine intent is that I may persuade men to come unto the God of Abraham, and the God of Isaac, and the God of Jacob, and be saved” (1 Nephi 6:4). Another concern is that we may not immediately recognize the tender mercies the Lord has bestowed upon us. Laman and Lemuel, for instance, saw their father’s vision about Jerusalem’s destruction as mere “foolish imaginations” (1 Nephi 2:11). As a result, they viewed their journey into the wilderness as an unnecessary retreat from civilization and a rash forfeiture of their family’s wealth. Nephi, however, was spiritually sensitive enough to seek his own revelation from the Lord, which confirmed the truth of his father’s vision (see 1 Nephi 2:16). What seemed like foolishness to his brothers, Nephi correctly recognized as a divine means of deliverance—or in other words, a tender mercy. L. Tom Perry, “The Power of Deliverance,” Ensign, May 2012, online at lds.org. Henry B. Eyring, “The Power of Deliverance,” BYU Devotional, January 15, 2008, online at speeches.byu.edu. David A. Bednar, “The Tender Mercies of the Lord,” Ensign, May 2005, online at lds.org. 1. See James E. Faulconer, “Remembrance,” BYU Speeches, June 23, 1998, p. 4. 2. It is also found in Proverbs 12:10. For KnoWhys discussing tender mercies in the Psalms and the Book of Mormon, see Book of Mormon Central, “Is ‘Nephi’s Psalm’ Really a Psalm? (2 Nephi 4:16–17),” KnoWhy 30 (February 10, 2016); Book of Mormon Central, “Why Does Jacob Quote So Much from the Psalms? (Jacob 1:7),” KnoWhy 62 (March 25, 2016); Book of Mormon Central, “Why Did Lehi Quote from a Psalm of Repentance In His Dream? (1 Nephi 8:8),” KnoWhy 325 (June 12, 2017); Book of Mormon Central, “Why Do Biblical Psalms of Lament Show Up in the Book of Mormon? (1 Nephi 8:8),” KnoWhy 438 (May 31, 2018); Book of Mormon Central, “Why Are Certain Biblical Psalms Used by Book of Mormon Authors? (1 Nephi 8:8),” KnoWhy 439 (June 7, 2018). 3. David A. Bednar, “The Tender Mercies of the Lord,” Ensign, May 2005, online at lds.org. 4. For extensive comparisons between Nephi’s slaying of Laban and David’s slaying of Goliath, see the appendix in Book of Mormon Central, “Why Was the Sword of Laban So Important to Nephite Leaders? (Words of Mormon 1:13),” KnoWhy 411 (February 27, 2018). 5. When Nephi’s brothers bound him with cords in the next wilderness rebellion episode, the theme of faith deliverance is repeated again: “O Lord, according to my faith which is in thee, wilt thou deliver me from the hands of my brethren” (1 Nephi 7:17; emphasis added). For more on deliverance themes in the Book of Mormon, see M. Catherine Thomas, “Types and Shadows of Deliverance in the Book of Mormon” in A Book of Mormon Treasury: Gospel Insights from General Authorities and Religious Educators, (Provo, UT: Religious Studies Center, Brigham Young University, 2003), 280–294. 6. 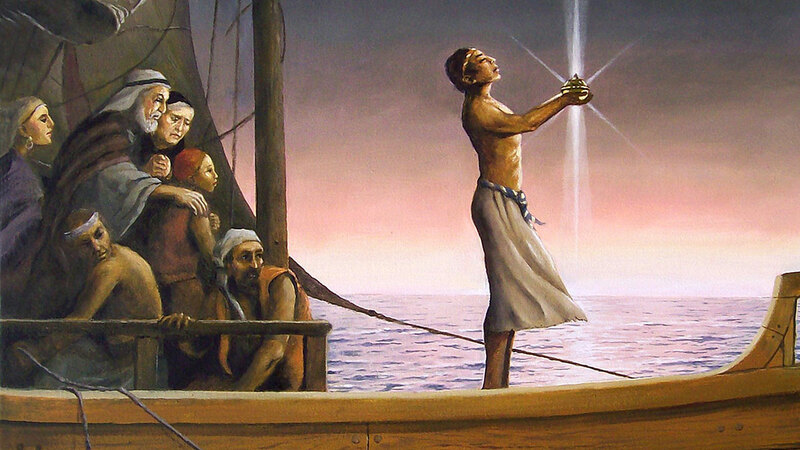 See Book of Mormon Central, “Why Did Nephi Include the Story of the Broken Bow? (1 Nephi 16:23),” KnoWhy 421 (April 3, 2018). 7. For a treatment of Nephi’s shipbuilding activity as divinely directed act of creation, see Alan Goff, “Boats, Beginnings, and Repetitions,” Journal of Book of Mormon Studies 1, no. 1 (1992): 67–84. 8. Several of these narratives, like the episode with Laban, even use some form of the word “deliver.” For instance, after Lehi’s sons persuaded Ishmael’s family to join them, Nephi’s brothers bound him with cords. In response, Nephi prayed, “O Lord, according to my faith which is in thee, wilt thou deliver me from the hands of my brethren” (1 Nephi 7:17; emphasis added). 9. See Matthew L. Bowen, “‘Their Anger Did Increase Against Me’: Nephi’s Autobiographical Permutation of a Biblical Wordplay on the Name Joseph,” Interpreter: A Journal of Mormon Scripture 23 (2017): 115–136. 10. See Book of Mormon Central, “How Can the Old Testament Covenants Help Us Understand the Book of Mormon? (1 Nephi 2:12–13),” KnoWhy 363 (September 12, 2017); Neal Rappleye, “The Deuteronomist Reforms and Lehi’s Family Dynamics: A Social Context for the Rebellions of Laman and Lemuel,” Interpreter: A Journal of Mormon Scripture 16 (2015): 87–99. 11. To be sure, Nephi certainly did intend to prove that he was chosen as a “ruler and a teacher over [his] brethren” just as the Lord had prophesied (1 Nephi 2:22). However, Nephi’s intent was clearly to give glory to God rather than retain it for himself. For the political purposes of Nephi’s record, see Noel B. Reynolds, “Nephi’s Political Testament,” in Rediscovering the Book of Mormon: Insights You May Have Missed Before, ed. John L. Sorenson and Melvin J. Thorne (Salt Lake City and Provo, UT: Deseret Book and FARMS, 1991), 221; Noel B. Reynolds, “The Political Dimension in Nephi’s Small Plates,” BYU Studies Quarterly 27, no. 4 (1987): 15–37. 12. Bednar, “The Tender Mercies of the Lord,” online at lds.org. See also, Neal A. Maxwell, “Lessons from Laman and Lemuel,” Ensign, November 1999, online at lds.org. 13. Elder Dieter F. Uchtdorf has taught that “when we step back and take an eternal perspective, when we look at our lives in the frame of the gospel of Jesus Christ, we can begin to see how the various dots in our lives interconnect. We may not be able to see the entire picture just yet, but we’ll see enough to trust that there is a beautiful, grand design. And as we strive to trust God and follow His Son, Jesus Christ, one day we will see the finished product, and we will know that the very hand of God was directing and guiding our steps.” Dieter F. Uchtdorf, “The Adventure of Mortality,” Worldwide Devotional for Young Adults, January 14, 2018, online at lds.org.